Only a few months after a German documentary about a famous artist, Anselm Kiefer, here is another from Germany about a famous artist. Gerhard Richter Painting is, like the earlier film, a kind of residence with its subject rather than a report. Corinna Belz, the director, in fact spent three years off and on with Richter, with his beginnings of works, his changes, his resumptions, his conclusions. She had made an earlier short film about Richter, and evidently she had his full confidence. He is at ease, both at work and in talk, absorbed in the doing, frank but reticent in speech. In response to questions, he keeps saying that one cannot talk about painting, yet he keeps trying to do it in a modest, honest, unprescriptive way. Now in his eighties, long past the arrival of fame and long comfortable with it, Richter, wearing workman’s dress in his huge studio, moves slowly without bursts of “inspiration.” This is especially interesting because his major style is Abstract Expressionist. That style, which once was also called action painting, implies bursts of vision and eagerness to capture it. But Richter takes his time, considers often over a period of days, then comes back and adds to or otherwise changes the work. Probably this is common among his fellow stylists, but to the viewer this contrast between the contemplation of the artist and the implied surge of the work is fascinating. 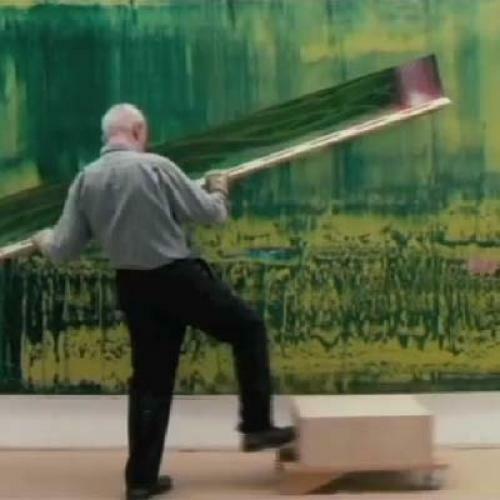 Early in the film Richter goes to a large blank canvas with a big brush—a housepainter’s brush—dripping with yellow, makes some large strokes, then withdraws. Later he takes a squeegee, probably six feet long, soaked in blue, and wields it across the same canvas in somewhat horizontal, casual-seeming strokes. Other touches follow, from time to time. This sort of work, of which more examples are seen, finished or being finished, is only one of his modes. We also see, for instance, a series of six canvases, all the same size, each painted a solid gray. Quite evidently he paints the way he wants to paint on any particular day. At the other end of the realism spectrum, Richter is much concerned with photographs. The opening shot is of him with a camera. He has developed a series of paintings that either are photos overlaid with paint or photos reproduced in paint. He has said, probably dryly, that photographs make the choice of subject easier. To us, it looks as if he is saying that the whole of the realism idea, pro and con, is manageable. Yet Belz’s film confirms—even though it has long been true—that Richter’s chief interest, Abstract Expressionism, is no longer a subject for debate. It exists as part of the empire of art. Although the methods of creation are very far apart, it makes me think of John Ashbery’s poetry. When Ashbery writes a lovely line, does he know which line will follow it? It seems as if he knows only that one will come. His poems often seem like pursuits of the next loveliness. Does he pause, like Richter, between strokes? In any case, some artists in more than one art have come to see the making of a work as an adventure in itself. Belz cheers this view on. NANNI MORETTI is one more of those foreign film figures who are internationally famous except in the United States. He is an Italian writer-director-actor who has been filming since around 1976 and who has a deserved reputation for the personal tone of his work. His films often present him as an inquirer into social and political and religious conditions in Italy, in a mildly radical way. The pictures of his that I have seen give me the feeling that, in dramatic and often humorous ways, Moretti is making me privy to his own feelings. At least one of his films, The Mass Is Ended (1985), sadly ignored here, is first class. Moretti there plays a thirtyish priest who is assigned to a parish in Rome where he grew up and where many of his communicants were fellow teenagers with him. The film examines both the lay and the religious life with contrasting reverence. Moretti’s latest work looks at the church sympathetically, veristically, comically. We Have a Pope—in the Latin original, Habemus Papam—is the meaning of the white smoke that arises from the chamber where the college of cardinals votes on a new pontiff. When the smoke is black, they are still voting, and the oceanic crowd in St. Peter’s Square waits, praying. With the white, they cheer. In this screenplay by Moretti, Federica Pontremoli, and Francesco Piccolo, the white smoke is only the beginning of the trouble. We have been with the cardinals while they commented and considered, often with touches that gave each a touch of individuality. (Admirably Moretti treats the clergy as human beings without a speck of facile mockery.) They agree at last on Cardinal Melville, but their decision overwhelms Melville. He feels overwhelmed, incapable. He is even unable to step out on the balcony and bless the crowd. A spokesman makes some excuse on his behalf, and Melville retires. A doctor is summoned, and the new pope is found physically able. A day or so passes, and a leading psychiatrist is called—a frank unbeliever. Melville responds skimpily, unhelpfully. The worldly psychiatrist passes advice to the cardinals and officials, but to no avail. Meanwhile, the entire world is wondering what happened: a new pope has been named but is invisible. Melville, somewhat dazed still and reluctant, manages to slip out of the Vatican into the streets of Rome in civilian dress. He has modest little adventures, as any lost elderly man might have, while the world is screaming for him. Finally, exhausted, he takes a room in a hotel.There he meets a troupe of actors who are rehearsing The Seagull, and he is delighted. His sister loved Chekhov, and he has learned the work through her. Chekhov helps him now, with kinds of acceptance and reassurance. Most of the film is so good that it ultimately disappoints a bit. The idea is so original and every detail is so well turned that we expect a conclusion more stirring than this pleasant Chekhovian one. Moretti and co-writers came upon a good premise—the retreating pope—but have not used it to a really large enough conclusion. Meanwhile, we can be grateful for the richness of the environment, and for the performances. Moretti plays the unbelieving psychiatrist with great ease and openness. Melville is played by the excellent French actor Michel Piccoli, who has often appeared in Italian films. (If he is dubbed in Italian, which I don’t know, it was done perfectly.) He gives us movingly the fright of a devoted man who suddenly feels unworthy. Throughout we see the scurryings of Vatican officials dealing with the crisis. I remembered that when I was living in Rome I knew an English Catholic journalist who covered the Vatican and who often told me of backstage politickings there. I asked him once how these mundane doings affected his religion. He said, “They decrease my faith in the Church and they increase my faith in God.” Some of Moretti’s viewers may agree. DEVOTIONS DIFFER, from the monumental to the personal; but whatever it is, so long as it is not antisocial, we generally feel good when we see it in practice. It seems to be what each of us should have for completion but what not everyone is lucky enough to find. Jiro Ono found his more than seventy-five years ago, when he was nine. Jiro Dreams of Sushi tells his story. When he was a boy in Tokyo, he learned how to make sushi, and, so to speak, he has kept on learning ever since, perfecting as he goes. The astonishing result is that he now owns and runs a sushi place in Tokyo that is world-famous—at least in the food world. It is not even a restaurant. It is an attractive little sushi bar with ten bar stools, for one of which you must reserve a month in advance. Jiro’s bar has three Michelin stars. Now in his late eighties, he is a neat, small man, still quick, still fierce in his domain, still completely assured that what he takes seriously is as good a locus for seriousness as another. We see him go to the (enormous) Tokyo fish market, shopping, accepting the magisterial role in which the dealers see him, selecting, for instance, one section of tuna out of a huge fish. His rice shopping, too, is expert. Jiro has two sons. The older is second in command; the younger runs a branch of this shrine under the paternal eye. About them both I scented a touch of Prince Charles waiting, however affectionately, for the monarch to pack it in. Unlike the prince, however, these heirs seem ready. This documentary was made by a young American, David Gelb, surely and simply. Gelb apparently understood that his subject was itself so taking that he wouldn’t need filmic embellishments to keep his viewers alert. In any case, I couldn’t help envying his and his crew’s lunches during the days of shooting. Stanley Kauffmann is the film critic for The New Republic. This article appeared in the May 10, 2012 issue of the magazine.